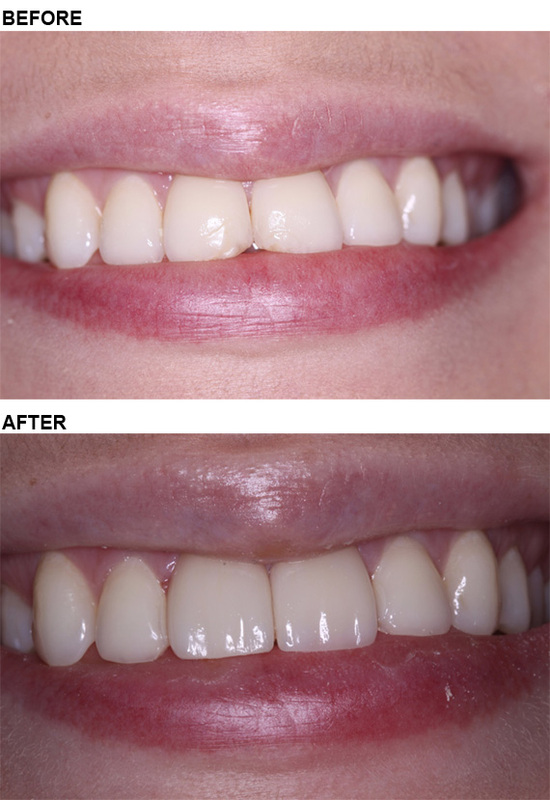 Porcelain veneers placed to correct old bonding and tooth misalignment. Will last many, many years. 20 years ago, my two front teeth were bonded in order to fix the rigid edges at the bottom. For as long as I can remember, I never was able to bite into anything that was of hard consistently, such as an apple. I had to cut the apple into small bites to protect the weak bonding. As years went on the bonding would crack and I would go back to the dentist to get it repaired. The trips to the dentist were becoming more and more frequent and I knew it was time to explore my options. I went to a couple different dentists to get their advice, but it wasn’t until I was referred by a friend to go to Dr. Matson that I found the person that would recreate my smile to perfection! I met with Dr. Matson a couple times with a year to discuss my options and he was very patient with me. Once I decided to pursue the veneer option, Dr. Matson, answered all of my questions at every visit and his demeanor, put me at ease. He even gave me his cell phone number just in case something went wrong with my temporary teeth and I needed him over the weekend! I drove 1 hour to every visit and never dreaded the trip once. My sister, has veneers and they look amazing! She lives in Las Vegas and had veneers done by a dentist in Nevada and I had no doubt that Dr. Matson would install my veneers that would look just like hers. I was very, very impressed with the outcome and I have been told, “your teeth look amazing did you have something done” from family members and friends who didn’t know I had my teeth done. It wasn’t until I went to the apple orchard this year and bit into an apple that I picked off of a tree and bit into it for the first time that I truly smiled. Dr. Matson, I can’t thank you and your team enough! These veneers not only gave me the perfect smile, but I am now able to eat my favorite foods without the fear of taking another trip to the dentist. This is a case just completed that replaces old failing bonding and chipped front teeth with beautiful porcelain veneers. 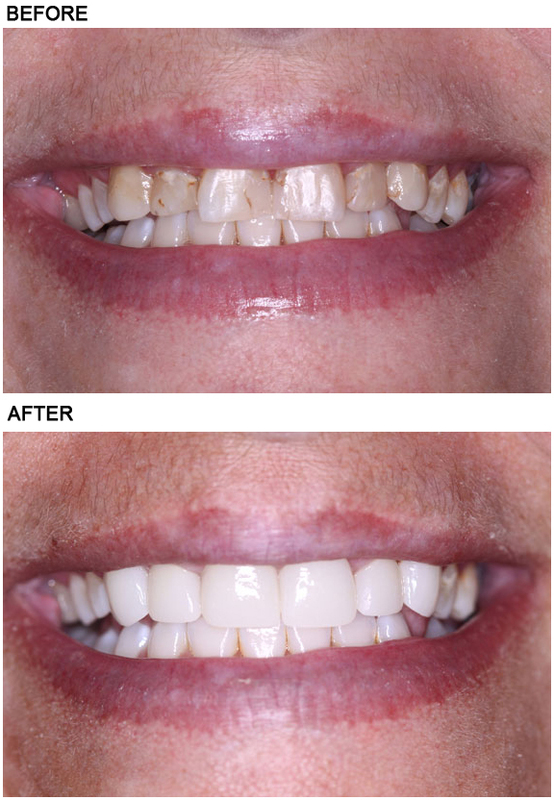 Before and after photos of a case showing restorative treatment consisting of porcelain veneers and an implant crown. 6 anterior crowns replacing old discolored restorations. Years of periodontal disease had claimed many of Bob’s teeth, however crown and bridge work has redefined his smile! We closed theses unsightly spaces between front teeth with a composite resin veneer for a more aesthetically pleasing smile. Crowns placed on the patients front teeth to improve her smile.